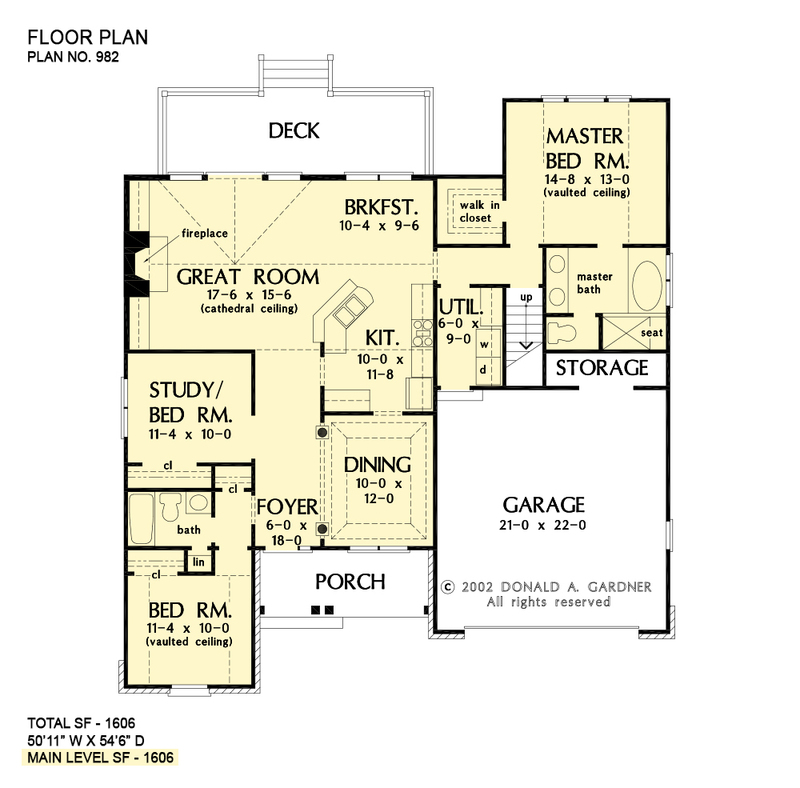 This easy living house plan with convenient front-entry garage makes the most of its footage. Including custom-style features such as: decorative ceilings, built-in cabinetry, and a fireplace, it's designed to please. An angled counter services the great room and breakfast nook and provides informal seating for quick meals and conversation. 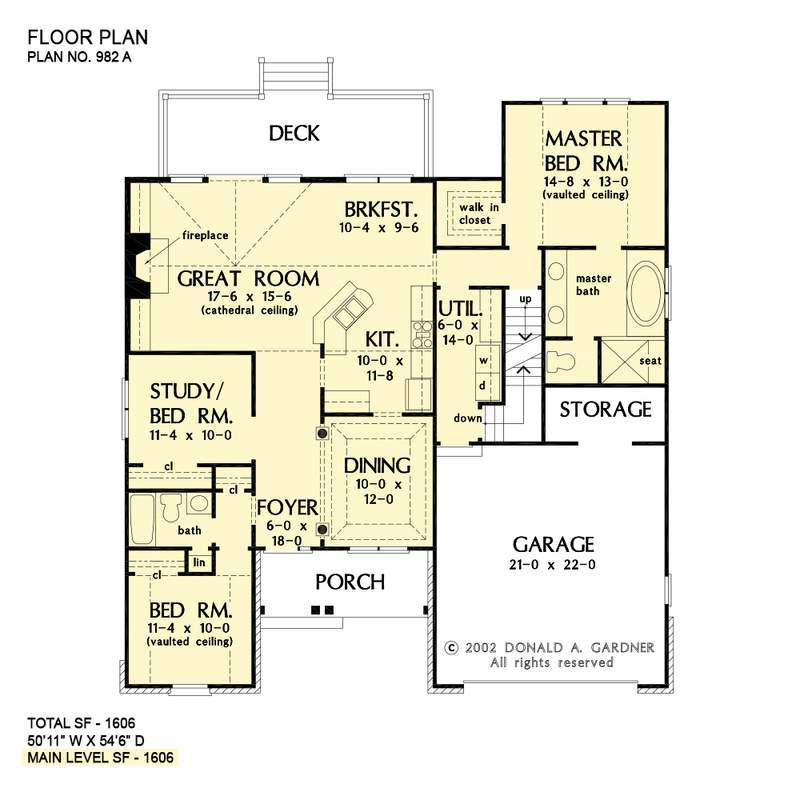 1st Floor: 1606 Sq. Ft. 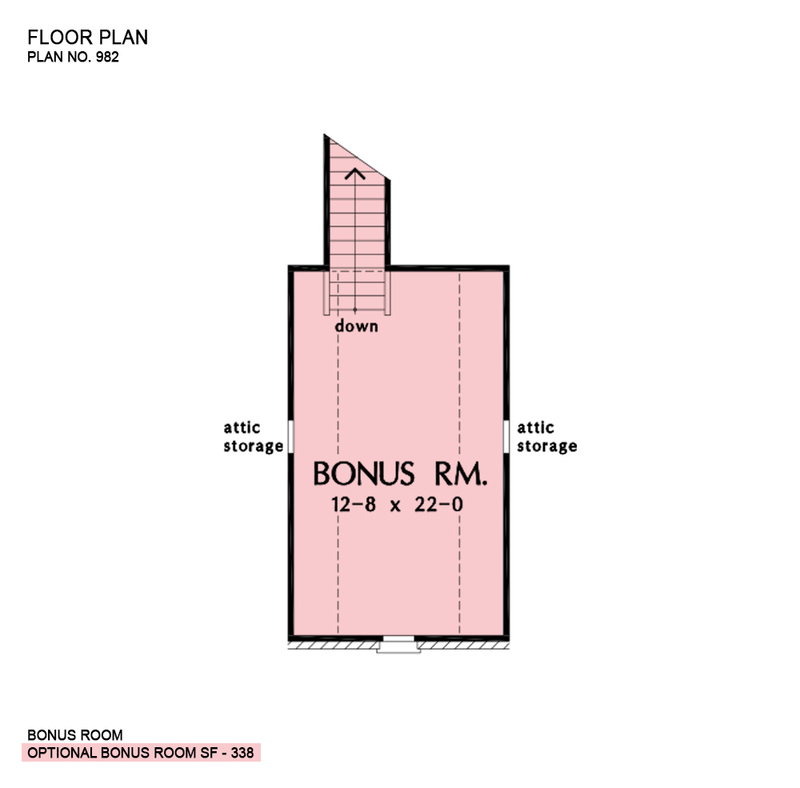 Bonus Room: 338 Sq. Ft.
House Dimensions: 50' 11" x 54' 6"
Great Room: 17' 6" x 15' 6"
Foyer : 6' 0" x 18' 0" x 9' 0"
Dining Room (Tray): 10' 0" x 12' 0" x 10' 6"
Great Room (Cathedral): 17' 6" x 15' 6" x 16' 9"
Kitchen : 10' 0" x 11' 8" x 9' 0"
Breakfast Room (Cathedral): 10' 4" x 9' 6" x 16' 9"
Utility Room : 6' 0" x 9' 0" x 9' 0"
Bonus Room : 12' 8" x 22' 0" x 8' 0"
Garage : 21' 0" x 22' 0" x 0' 0"
Garage Storage : 11' 0" x 3' 0" x 0' 0"
Master Bedroom (Vaulted): 14' 8" x 13' 0" x 13' 1"
Bedroom #2 (Vaulted): 11' 4" x 10' 0" x 11' 8"
Bedroom #3 : 11' 4" x 10' 0" x 9' 0"
Porch - Front : 15' 5" x 6' 2" x 9' 0"
Deck / Patio : 25' 2" x 8' 0" x 0' 0"